Expect this: Trump's outside legal team will read the report separately from official White House attorneys, per Axios. Expect a more aggressive response from the first camp. The post has a quote from aide Kellyanne Conway that might hint at a preview: "If we've gone from two years of roaring 'indict and impeach' to now a more resigned 'embarrass and harass' the president ... then no wonder many Americans demand answers as to how this all started and who was involved." Echoing that: The president on Monday echoed Conway's point. "Mueller, and the A.G. based on Mueller findings (and great intelligence), have already ruled No Collusion, No Obstruction," he tweeted. "These were crimes committed by Crooked Hillary, the DNC, Dirty Cops and others! INVESTIGATE THE INVESTIGATORS!" Refusal to prosecute means those alleged to have broken laws cannot offer a defense. That may justify redacting that from public disclosure but it can easily be misused too. 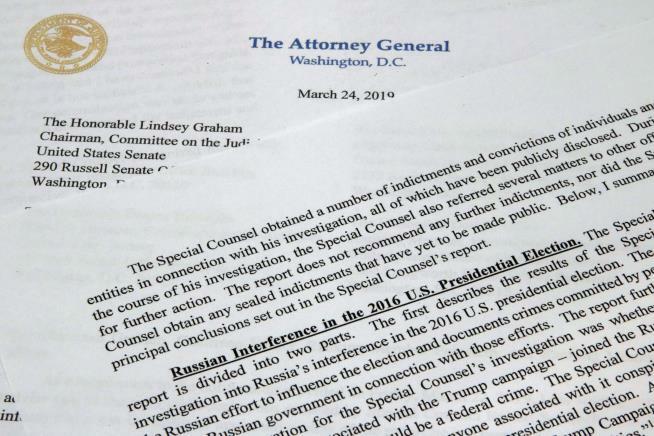 And there should be no redaction from the report given to the body charged with determining if any of the evidence constitutes grounds for impeachment, including impeachment of the attorney general for political motivation or other malfeasance in the process of redacting information itself. Trump claims there was no obstruction but Barr seems to qualify it as no illegal obstruction and that seems to be built on his opinion and belief that a president can do anything he likes with any investigation and it cannot be construed as obstruction of justice. Aren't liberals all cried out by now? Because of these redactions the conspiracy enthusiasts will have fodder for generations to come.